salvation | Life. Seriously? Funny! Life, Always Serious, Often Funny! David Hockney is best known as being the artist who sold the most expensive painting to date: his “Portrait of an Artist (Pool with Two Figures)” sold for $90.3 million dollars (USD). The portrait initially sold for $18,000 back in 1982. Granted, I’m not really an art critic; I’m an observer of human behavior, a teacher, counselor and pastor. Yet as I looked over Hockney’s portfolio I noticed there are inconsistencies which I would have thought would have caused rancor in our egalitarian and politically sensitive culture. There exist many themes in Hockney’s paintings. Homoeroticism reoccurs often. Yet just as often the portrayal of women has a perceptual twist. With only a very few exceptions over the course of Hockney’s 81-year lifetime, the portrayal of women is minimally Cubist-leaning and his perceptions reveal an inability to come to terms with the female form. His depictions of women are misshapen, as if M. C. Escher chose to paint portraits. His depictions of men are clear, detailed, vivid and exhibit proof of their importance to the eye of the painter. Yet Hockney’s rendering of women is nothing like his perception of men. Women are either vague in detail and appearance or they are horribly distorted. Some may say, “As with his depiction of men, Hockney is merely reproducing what he sees.” So, are we to believe Hockney purposely chooses beautiful men yet he seeks out women who possess no innate beauty and lack humanizing attributes? This is much more than seeing a glass that is, “half-empty” or “half-full.” Those who applaud the beauty of simplicity, the vividness of color which exists in Hockney’s works, should also observe an inability to see the beauty extant in both sexes equally. Hockney routinely mars the mouths and noses of the women he portrays; symmetry is exchanged for twisted asymmetry. When Hockney deigns to sketch a female subject, they are just that: a sketch, lacking detail, life, reality and color. Again, this is not a judgment of Hockney as a person but rather his work. No one in this world is above either the influence or the distortion experienced in the circumstances of life. The art world loves to pile approbation and applause on Hockney and his work. Hockney exhibits a clear eye, colored with his unique perspective of his perception of light, color, space, depth and subject. Yet as the critics exhaust their adjectives on the product of his mind, they overlook the lack of clarity he selectively uses on female subjects. The person who purchased “Portrait of an Artist (Pool with Two Figures),” made a choice to buy this work yet passed by so many others of this artist. The questions regarding why Hockney chooses to depict his female subjects as he does should not cause us to judge him and to demean the genius of his work. Yet it is legitimate to query his raison d’etre. All humanity is art. True, the canvas has been ripped, ablated by time and circumstance. Poor choices and lifestyles also affect who we are. To a degree, there exists a truth in the beholders ability to perceive beauty; yet we cannot overlook the innate, intrinsic value extant in all human life. How is this possible? If a picture, a photograph, is worth a thousand words, who chooses the words? The words which are chosen, what do they reflect? Are not the words of description, the adjectival efforts put forth to describe the perceived reality, are they not also affected by the person doing the describing? The Apostle Paul writes in Ephesians 2:10, “For we are His workmanship, created in Christ Jesus for good works, which God prepared beforehand, that we should walk in them.” What is fascinating, is the word translated “workmanship” comes from the Greek word poiema, where we get our English word poem. Those of us who know Jesus Christ as our Lord because we have accepted salvation by the faith given to us, we are the “poem God created us in Christ Jesus to accomplish good works.” The poem itself did nothing; it is a creation of the mind of the author. Its beauty, its meter, the rhyme and the measure are all reflections of the author. The poem didn’t create itself; it became a poem when it was written. Hockney’s paintings received no applause, no accolades until he set them on canvas or whatever medium he chose. His perceptions demonstrate the flaws extant in all of humanity. Yet within those flaws, we can understand the need for correction. God, through Jesus Christ, provides the correction to all of our flaws—and He is available to whoever desires Him to fix their plight. Our value was determined by the price paid. Jesus Christ died for those who accept the gift of God. What kind of value could we—a finite, sinful and rebellious creature—put on the life of the Son of God? Me, Myself & I against God! Forgiveness. Easy to say yet more difficult to actually achieve. Why is forgiveness so hard? I’m into my third decade as a pastor now. Over the years I have met people—good people who know the Lord—yet they have no problem telling me there is someone they know, someone with whom they have had a relationship in the past and now, because of something they did, they said, or they caused and now they cannot forgive them, ever. So, does this mean that what we “feel” should be automatically discounted and disparaged? Not at all. Feelings are always a response; a response to people, to circumstances and even to thoughts—ours mostly. Unfortunately, feelings are ephemeral, they change, have no solidity (or reality) and how we “feel” often soon changes as soon as the pizza we have eaten is digested. I am not surprised when those who do not have a relationship with God through Christ do not forgive. People who are lost or pagan have not been “recreated” as Paul writes in 2 Corinthians 5:17. They are acting according to their created order; they are not less than believers because believers were once just like them. Yet believers in Christ are to look like Christ and act like Him! Paul makes it very clear that “those whom He [God] foreknew, He also predestined to be conformed to the image of His Son” (Romans 8:29, ESV). What God foreknows and predestined is reality; it is what is real. Of course, those who are more attentive and observant immediately realize there are many people who profess Christ as their Lord and yet they do not either “look” or “act” like Christ. How can this be if the reality is that God has made us to look like Christ? The same God who made us to look like His Son also gave those He made this way true freedom and will. Those who do not forgive have made the choice to purposely disobey and to not forgive! People who are judgmental will themselves face judgment. People who are constantly condemning, will themselves face condemnation. People who forgive will find forgiveness. The way we act and live will be the “measure,” the means by which our lives will be measured and judged by God. Oh, and try not to oh-so-quickly state, “Hey, this has nothing to do with salvation!” You are correct; it does not. Yet this does apply to our eternal reward as believers! I know some people who tell me how much they love Jesus, how long they have been in church and all they do for people, yet they are often cranky, mean-spirited, angry and demonstrate very little of Jesus in their life. God will make sure they are rewarded accordingly. There are people who have literally lost brothers, sisters, mothers and fathers and other family because of the actions of an individual. I’ve heard them tell me they “will never forgive that person.” The longer I know the Lord, the more I understand they are destroying their rewards and robbing themselves of blessings in the here and now. Who do we think we are as believers when we make such statements? God’s One and Only Son paid for our sin, and then the Father because of that payment has forgiven us. Do we actually think we are “bigger” or more important than God? I’ve actually had people say, “God has blessed me the way I am.” Okay, but how much more could he have blessed you if you were obedient to Him? In my life, Me, Myself and I are the most self-centered, often evil and selfish persons I know; I know them because I am them! As I age, and as I mature in my relationship with Christ, I am more and more amazed that God the Father has forgiven me and especially Jesus Christ has also forgiven me. Especially Jesus; as my Advocate, He knows all of my Issues whereas the Father only sees Jesus! Praise God! 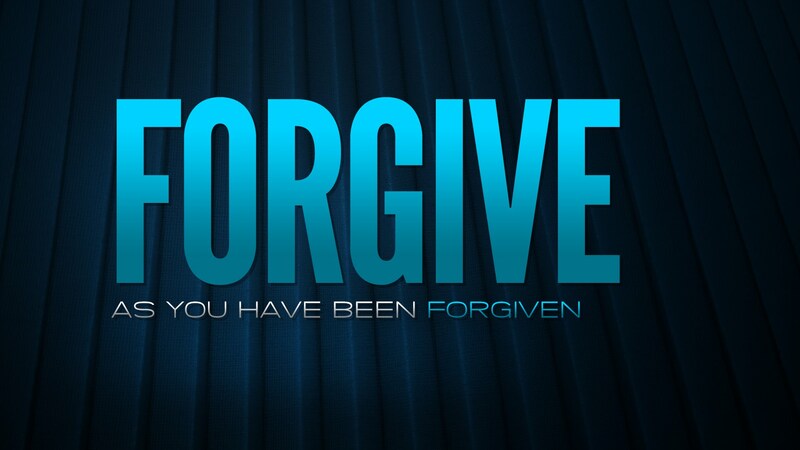 Because I am forgiven, I can now forgive! In many ways, Stallone may be underrated as a talent; in other ways, quantity does not always equal quality . . . . 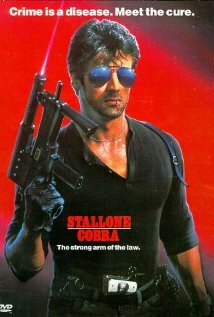 The most compelling aspect of the movie Cobra was its tag-line: “Crime is a disease. Meet the Cure.” This short seven word phrase communicated the entirety of the movie’s plot; Stallone is a tough cop who will clean up the mean streets filled with crime. It would have been better, however, to simply add as a reprise from Rocky III the Survivor ballad, “Eye of the Tiger” to mitigate some extremely sad screenplay . . . . This past weekend my wife and I went to see the movie Noah with some longtime friends of ours. After spending enough money to secure a very nice steak dinner and tip at the steakhouse, we settled in for the 138 minute long interpretation of the biblical story of Noah and the Ark. While Stallone fought crime, Russell Crowe fought the ecological equivalent of ignorance: people! Darren Aronofsky who is both a writer and the director of the film Noah stated in an interview with the Washington Post he didn’t have much detail to work with from the four chapters in the book of Genesis (where the story of Noah is contained). Aronofsky observed in the book of Genesis not one word of Noah is recorded; he also points out the name of Noah’s wife, nor the names of any of the wives Noah’s three sons, were recorded. He made this point in the context he had taken liberties with the biblical story. He did take liberties, but eight minutes of spoken word cannot equal 138 minutes of film; he had to add “something” to the story! For the moment, let’s examine some of the additions and the messages inherent in the film. The biblical story mentions nothing regarding the environmental impact of the pre-flood humanity on the earth. The film makes it clear everywhere man was prior to the flood he also destroyed the environment. Animals were hunted to extinction, lands were deforested and there was a clearly implied element of cannibalism in one of the scenes near the end of the film. The biblical account makes it clear there were eight people on the ark: Noah, his wife and his three sons and their wives. The biblical account also gives us a means to understand Noah’s sons were around 100 years old when they entered the ark. One of the greatest mysteries of Scripture is the awesome fact man was created in the “image of God” (imago dei); it is this fact which places the true value of man and human life into perspective. Man has value because he was created by God, made in God’s image and because of Christ’s death on the Cross, we belong to Him. To place this statement in the mouth (no pun intended here) of Tubal-Cain undermines the integrity of this fact and its importance; it also prejudices the viewing audience against the statement we were made in the image of God. One of the most gratifying things of this movie was Aronofsky’s depiction of the ark. This was the most realistic and biblically accurate representations of the true size of the ark I have ever seen. I read several interviews of Mr. Aronofsky and his Jewish heritage and upbringing surely influenced his desire to show deference to the biblical story. I did not go to this movie expecting either biblical or orthodox accuracy, but the movie was majestic in its sweep. For all it had, it was what it did not have which misrepresented this story of judgment, salvation and mercy! Gone was the concept of grace—a loving God choosing one man and his family from the midst of a fallen, depraved and incredibly sinful humanity. God chose Noah not because Noah was good, but because God was good and chose Noah to demonstrate His goodness to him and his family! Aronofsky’s Noah is following a Creator who neither prepares His chosen spokesman nor provides clear evidence of His existence through revealing His plan to Noah. Russell Crowe’s portrayal of Noah, while believable and empathetic, is more akin to a wild-eyed jihadist rather than the man of God who served his Lord for 120 years—one who served his Lord while building the ark and testifying of God’s coming judgment. The movie neglects to mention how God shared with Noah not only His intentions (judgment of all who have the breath of life in them and detailed instructions for building the ark), but also the reason why God was judging the earth; the Genesis story relates it was because of the wickedness of man which spread throughout creation. The movie would have its viewers believe it was the aggression against nature, its animals and the eco-system man had destroyed which caused the Creator to destroy the earth with a flood. The message of the movie is just as man is destroying and has destroyed the ecology of this planet today, humanity prior to the flood did the same. In the biblical story God sent the rainbow as a testimony He would never use water to destroy the earth again (the next judgment from God will be fire according to 2 Peter and Revelation), yet it is almost ironic environmentalist today are using global warming to herald a new era of coming floods with rising sea levels which will again destroy our world. The denouement of the movie occurs in the final few minutes of the film. Noah, in an act clearly running counter to the stated goals given to him by the Creator, refuses to following the thus-far revealed “will” he is to accomplish. Rather than choosing to end the lives of the two infants, Crowe’s character states, “As I looked I them I was filled with love” and he chose to allow them to live! The dramatic license taken with the facts of the biblical account and even to the point of changing the motives, attitudes and milieu of the characters was understandable and I even accepted all up to this point. Face it, I did not come to this movie to receive a brush-up lesson in biblical theology! Yet the implications which resonated from Crowe’s utterance was unmistakable; when it comes to a choice between following God (in the movie, “the Creator”) or listening to what is in the heart of man, man far too often has a superior morality based on love rather than retribution from a judgmental Creator. I am not angry about the message the writers and director are sending. The message being communicated is this: while man has destroyed the Creation (and in this movie, the creation is treated with an almost god-like worship) and the Creator has judged and destroyed man and all life for doing so, only man is capable of overriding the will of the Creator (judgment) through a perceived superior moral claim, love. This is unfortunate in the extreme. Whether through a purposely motivated decision or through an unfortunate experience of circumstances, this movie portrays God as a capricious hateful being who forces those who would serve Him to guess and surmise His will through inference. 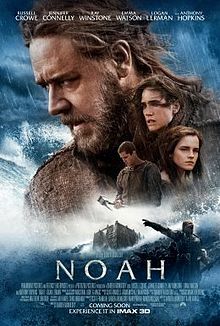 Even though in Scripture God never expects nor asks man to act on or be judged by that which man does not know, in the movie Noah, it is Crowe’s Noah who rises above the circumstances and provides the true rescue and salvation. Crowe’s character believed God chose him and his family to be the last of humanity for the purpose to provide a means to reseed the animal kingdom on the newly cleansed earth. It was only through a change of heart in Crowe’s Noah which allows man the opportunity to repopulate and multiply on the earth once more. After his family saw the protection of the animals and their release after the subsiding of the waters, humanity would have ended with them; in some ways this would have been but a slight change in the motivation behind some of today’s suicide bombers. They will surely die, and others with them, but it is a necessary death needed to accomplish the will of their god and guarantee them paradise. Noah is a fast moving film with plenty of drama and action. The PG-13 rating is due to the scenes of violence and implied animal violence. The acting is superb—which is what motivated me to see this film—but the film leaves one feeling there has to be something more; a better reason, a better explanation or even a better plan for such an event to occur. God’s intention for the believer, non-believer or even someone who is merely searching, is for them to see the need of a Savior through the events of the Genesis account and the events of our world today! Christ is our ark and our salvation who bore us through the judgment of God. Yet it was God who initially chose Noah and his family to be saved. It was God who provided an ark, the plans, the guidance and the animals to allow life to begin again on a cleansed earth. Of course in the Noah epic, man was still flawed and capable of sin and poor decisions, yet God had a plan to eventually bring His Son to this world so all people who accepted His gift of salvation could come to Him! Those of us who know Christ are also chosen by the Father! Those who know the Son as Lord are rescued even though our bodies are corrupted by sin. We will live again in Heaven with God when we have accepted the salvation the Father freely offers to us. One day Christ will return for us; there will no longer be crime, or disease or flaw or flood or death, for all will be perfect. And perfection needs no cure. Never Knew I Was A Sheep!